Let’s talk about the 9 things every electronics hobbyist should know (at least something) about. Ohm’s Law is one of those things you can learn relatively quickly. It is the starting point for all circuit analysis and design — basic, yet very powerful. Want to know what value of resistor you should use to connect that LED to your Arduino so you don’t fry your LED or the Arduino? Ohm’s Law to the rescue. How about figuring out how much power your gadget draws so you can estimate battery life? And exactly how much voltage drops across that component? Inductors and other components use color code, but here we’re talking about resistor color code. Resistors are the most basic, yet fundamental electronic part. They’re quite common and you’ll use them a lot. That’s why being able to quickly identify resistor values by reading the color code is a good skill to have. When I went to tech school, resistor color code was one of the first things we learned. And it wasn’t difficult. With practice, you’ll be able to pluck the appropriate resistor out of your parts bin in a second or two. That sure beats having to go online and use a color code calculator. Here’s a good resistor color code tutorial, do yourself a favor and brush up on it if you need to. People can create some very cool, amazing things with no microcontroller; instead they use discrete components and non-microcontroller ICs. I remember seeing a digital clock consisting of transistors, resistors, capacitors, 7-segment displays, and discrete ICs. Not a microcontroller to be found. And sometimes, using even an 8-bit microcontroller or lower-grade Arduino is an overkill and unnecessary. However, if you really want to take your hobby and interests to the next level, you’ll need to become familiar with microcontrollers. And here’s why: some things are either very difficult, costly, or even impossible to build without the use of microcontrollers or trainers like Arduino and RPi. I assume that most readers have at least some experience with stand-alone microcontrollers, or as is becoming more common these days, development boards (or trainers) like Arduino and other similar boards. If not, I strongly suggest you start experimenting with them and open the door to this amazing world where you can create anything to do just about, well, anything. Whether you start with old-fashioned stand-alone micros like the PIC or development boards like the Arduino is your choice, but I suggest you eventually get some experience working with both. Some readers wrongly think that Arduino is a microcontroller. Other’s aren’t sure what the difference is between something like Arduino and a stand-alone microcontroller. And others work with development boards and trainers exclusively. If you’re one of the above, you should read Getting Naked: Working With Naked Microcontrollers vs Trainers Like Arduino. We touched on Ohm’s Law earlier, but there are other basic fundamentals of electronics and electricity that you should understand. Do you know the difference between AC and DC? How about the difference between analog and digital? Electrical grounding is another confusing, often misunderstood affair. Getting Grounded: Types of Electrical Grounding and What They Mean can help clear away the fog surrounding this topic. Another confusing, hotly debated topic is which direction current actually flows. Is it from negative to positive or vice versa? Conventional Current vs. Electron Flow: Which is Correct? Can help answer that question. In electronics, there are only three types of circuits: series circuits, parallel circuits, and series-parallel circuits. Knowing the difference and how things like voltage and current behave in each one comes in handy. If you’re not sure what these circuits are or how they behave, please see Simple Circuit Analysis Techniques You Should Know. If any of the above seem uncertain to you, you should fill the knowledge gap. Let’s leave theory alone for a minute and talk about practical, hands on skills. Soldering is one of the most important of these skills and it is not that hard to become proficient at it. It’s also something that you need to actually practice to get good at. You can read about soldering technique all day (and maybe you should read about it a bit), but until you actually pick up that soldering iron and give it a shot you won’t become good at it. There are many small inexpensive kits for sale from various vendors that teach soldering skills while building an actual working, useful project. Also, there are video soldering tutorials online that can be helpful. And do yourself a favor, invest in an easy use, quality soldering iron like the Weller WESD51 Digital Soldering Station or the less expensive Weller WES51 Analog Soldering Station. I’ve owned the analog version for almost ten years and it still works great. Figure 1: Weller WE51 Analog Soldering Station. Surface mount soldering is a whole subject all on its own, but since more and more components are going that way it’s worth learning once you get a grip on through-hole soldering. 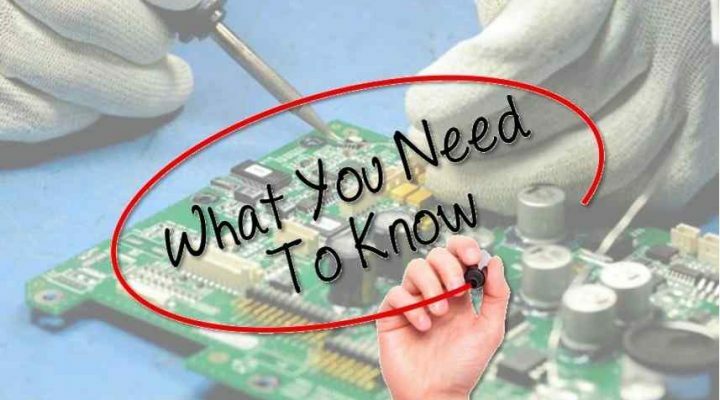 It’s debatable whether the most important tool on your bench is the soldering iron or digital multimeter (DMM). One thing’s for sure though — a good quality DMM is an indispensable tool. You’ll use your meter to measure resistance, check for circuit continuity, measure voltage, and measure current. Some meters also have extras like the ability to measure frequency, capacitance, transistor beta, and more. Obviously, you’ll want one that works with both AC and DC. Look for one that has as much functionality as you can afford. Fluke makes good quality meters, but they can be pricey. A more budget friendly DMM is the Elenco M1700. Mine’s served me well for 18 years now. This one ties into the third item. Yes, some people still program microcontrollers in BASIC, but C is quickly supplanting BASIC as the programming language of choice. And it’s no wonder. In the real world, embedded engineers often program in C or C++. In the hobbyist world, many popular development boards like the ubiquitous Arduino use C or a C-like programming language. Even operating systems are written in C.
Though the language of choice for many Raspberry Pi users is Python (also worth learning), you can program your Pi in C or C++ if you wish. Mastering a programming language takes a lot of time, patience, and practice. However, you can become proficient enough for many hobbyist-level projects with a bit of practice. There is a series of tutorials on C programming on this site. As of this writing there are 4 of them. If you’re not familiar with C, or need a review start with C Programming Tutorial 1 and work your way up through the rest. Reading and creating schematics (whether by hand or computer program) is something all electronics enthusiasts should be able to do. But first, you have to know what the various electronic components are. After that, you’ll need to know what schematic symbol corresponds to what electronic component. It also doesn’t hurt to at least have a basic understanding of what each component does. Fortunately, this isn’t too hard. Once you get a few projects under your belt, you’ll learn about many of the components and their schematic symbols. And using a PC to draw schematics can help accelerate that learning because you’ll need to be able to recognize the symbols for various parts. Once you get the basic electronic components and their symbols down, you’ll be sketching schematics for your projects on the back of a napkin in no time. Who said dinner with the in-laws had to be boring? Figure 2: a simple schematic diagram. It’s amazing how often the basics get lost in the dusty files of our minds, even for experienced electronics enthusiasts. Knowing the basic gates and digital logic functions is one of those things we take for granted and sometimes forget. Fortunately, there’s a tutorial for that. If you need bone up on basic digital logic check out A Tutorial on Logic Gates. You’ll lean about the basic logic functions like NOT, AND, OR, NAND, NOR and more (sorry for the rhyme). You’ll also get a primer on truth tables and some Boolean algebra. Don’t let the word “algebra” scare you, it’s easy peasy. Knowing this stuff is important because not only does logic show up in programming, but some projects and circuits can be made with simple gate ICs. This is cheaper and simpler than breaking out the PIC or Arduino for every small project or circuit. For example, you can use an AND gate to enable or disable a clock, as the figure below illustrates. Figure 3: the output of an AND gate is low if any of its inputs are low, regardless of the number of inputs or their states. In part (a), the clock signal passes because the other input is high. In part (b), the clock does not pass because other input is low. Of course, I’m sure you can think of other things any given electronics enthusiast should know. Maybe you already are a master of the nine things above, or maybe you’re just starting out and really aren’t sure about any of it. Many of us are probably somewhere in between. Regardless of your level of experience and knowledge, keep at it. Electronics is an amazing hobby which gives people the ability to create amazing things. And this site is a valuable resource for information on electronics, programming, and microcontrollers. Until next time, comment and tell us about your level of electronics experience. How long have you been dabbling? Are you an electronics professional like a tech or engineer? What’s your latest project about? #10 how to not release the magic smoke. Good one Phil. That’s definitely something all electronics enthusiasts should know! Not everything smokes when it goes bad. Never keep a bad component it will just fool you twice!